REALTORS® often need a simple way to find safe public, locations to meet prospective clients. REALTOR® Safe Harbors are locations who have agreed to allow REALTORS® to meet at their office/location. REALTORS® can simply go to http://REALTORSafeHarbor.com to quickly find all Safe Harbor locations in their area. The location can be quickly forwarded to a client with a few clicks. Mobile apps are available for iOS and Android and can be found by searching for "REALTOR® Safe Harbor" on the App Store or Google Play. To sign your office up to become a safe harbor, go to http://REALTORSafeHarbor.com. REALTOR® Safe Harbor is a partnership between the REALTOR® State Associations and Real Agent Guard: We're safer together. 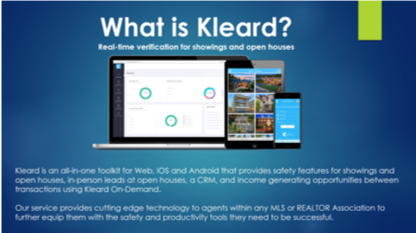 On-Demand marketplace for open houses and showings that allows agents within a brokerage to share open house and showing opportunities in an innovative way. Below are a variety of pre-designed safety forms that you can custimize and use in your office. As a REALTOR®, it’s important you have a personal safety protocol in place that you use every day with every client, like when meeting new clients, showing properties or sharing information online. There are a variety of tools you can add to your personal safety protocol, such as the smartphone apps and safety products listed on NAR's website here.